Four new O3b satellites have arrived safely at the Guiana Space Centre in Kourou, French Guiana, in preparation for launch by a Soyuz vehicle in March 2018. The four O3b medium earth orbit (MEO) satellites will be placed in orbit nearly 8,000 kilometres from Earth, four times closer to the planet than geostationary satellites. 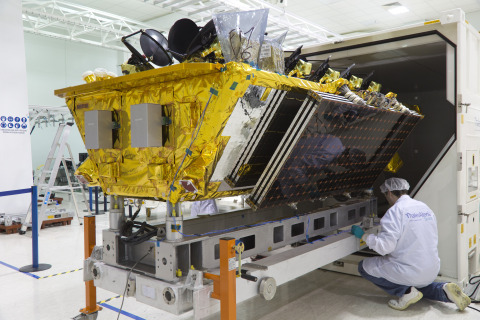 Built by Thales Alenia Space, the Ka-band satellites will offer low latency, fibre-like connectivity to people and businesses in the growing mobility, fixed data and government markets. The launch of the new satellites will augment SES’s fleet of 12 O3b satellites, which were also built by Thales Alenia Space. The four new spacecraft have improved connectivity capabilities and increased performance, and will serve to seamlessly scale the existing O3b constellation. Together, they will enable SES Networks to offer more capacity, enhanced coverage, increased efficiencies and greater reliability while delivering carrier-grade services including MEF Carrier Ethernet 2.0 certified services, to telcos, mobile network operators (MNOs), enterprises, internet service providers (ISPs) and government customers. SES will be launching another four satellites in the constellation with Arianespace in 2019, bringing the total number of O3b satellites to 20. The first 12 O3b satellites were launched by three Soyuz launch vehicles in 2013 and 2014.